Arvada’s transportation infrastructure is the City’s largest and most valuable asset. The City has increased funding towards street improvements in recent years and engages in ongoing street maintenance projects. The Pavement Condition Index (PCI) report included projections for average road conditions. Average conditions include roads that are good and roads that have failed. Review the report prepared by Atkins North America 2015 Pavement Condition Assessment. View the video produced by Arvada Media Services 2015 PCI Collection Data. For more information on road reconstruction, chip sealing, and more please explore Pavement Project Types. Street was resurfaced approximately 35 years ago, water and sewer main replacement and patching, severe alligator cracking, severe sub-base failure, severe oxidation and surface wear. Street was resurfaced 15 years ago, cracked sealed 7 years ago, new water line and trench patch 5 years ago, surface wear and oxidation. Street was resurfaced 6 years ago, there is no surface wear, minor cracking. minor oxidation. 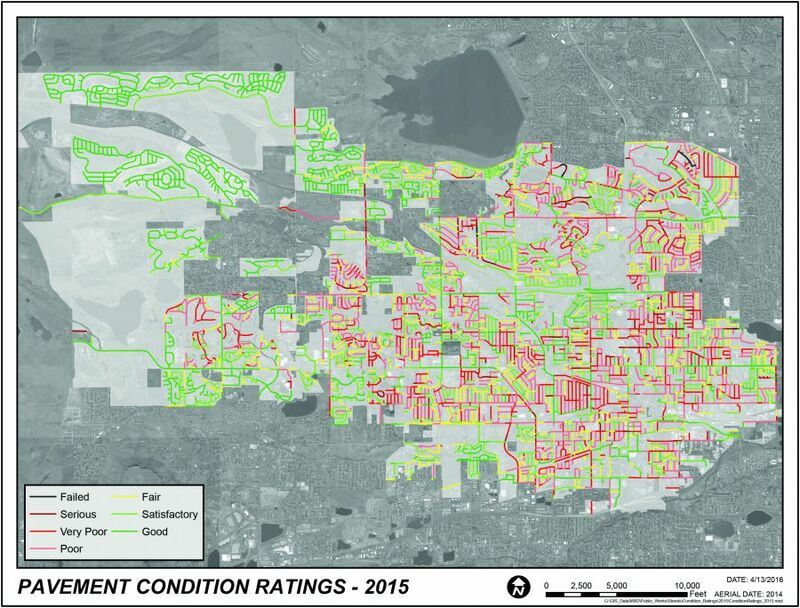 Every street or road marked pink/red is ranked between poor and serious.